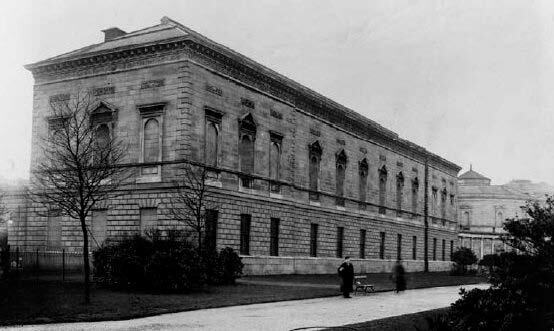 The Natural History branch of the National Museum of Ireland was built in 1856 as an expansion to Leinster House (home of the Royal Dublin Society) to house the zoological and geological specimens that were collected throughout the 19th century. It opened its doors to the public in 1857, but it wasn’t transferred to the state until 1877, where it became part of the Museum of Science & Art, Dublin and combined with collections from the Royal Irish Academy and Trinity College Dublin. Following the foundation of the Free State in 1922, the Museum has faced a great number of developments and restoration projects including a new entrance from Merrion Street (though some of the larger specimens still face the previous entrance), as well as gaining a large number of UK fossils from the Geological Survey of Ireland and the reinstatement of the grand stone staircase in 2010, three years after structural issues temporarily closed the building. 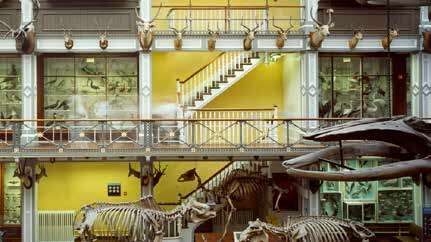 The Natural History building opened in 1857 to house the Royal Dublin Society’s growing collections, which had expanded markedly since the late eighteenth century. The Museum is currently running a seven-year digitization project to document every specimen (dating back to the Precambrian) in the collections, helping to streamline and preserve the museum catalogue as the collections grow and change. According to curator Matthew Parkes, the toughest curation battle is currently pyrite decay, which can strike even if environmental conditions for the collections are controlled extremely closely. The solution, he suggests, is to identify susceptible specimens and quarantine them in separate microenvironments. 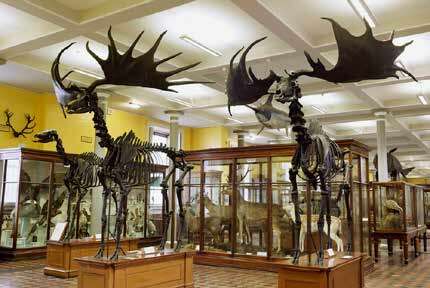 Of the collections on display, most of the specimens are zoological and archaeological, including what is perhaps the best collection of Giant Irish Deer (Megaceros hibernicus) in the world, a clear public favourite. After all, these giants stand at the entrance of the Irish Room of the Museum and certainly provide a lasting first impression for any budding naturalists who might be visiting the Museum for the first time. Another favourite specimen is a Rhomaleosaurus cramptoni, an original plesiosaur fossil from the Jurassic of Yorkshire found in 1848, the replica of which is the centrepiece to the London Natural History Museum’s palaeontological gallery. Although the R. cramptoni specimen used to stand in the Fossil Hall of the Natural History Museum in Dublin, this building was sadly demolished in 1962 to make way for a restaurant and bar for the Dáil (the Irish Parliament), so R. cramptoni was consigned to storage and awaits some much needed TLC. The building is a ‘cabinet-style’ museum designed to showcase a wide-ranging and comprehensive zoological collection, and has changed little in over a century. Often described as a ‘museum of a museum’, its 10,000 exhibits provide a glimpse of the natural world that has delighted generations of visitors for 160 years. The demolition of Fossil Hall is also one of the reasons that most of the extensive geological collection remains hidden from the public, with only 22 window cases dedicated to Irish fossils and minerals in the Museum. However, discussions are in progress to develop an Earth Sciences Museum on the National Museum’s site at Collins Barracks, a stone’s throw west of Dublin city centre. With such an expansion, the hidden gems of the collections may once again be shown to the public, some for the first time in over a century. One of the most pressing issues faced by the Museum is keeping younger generations engaged in natural history. Accordingly, the Museum offers a range of activities to capture the imaginations of youngsters, such as onsite handling sessions, tours and workshops. The Museum also hosts exhibits at major science exhibitions in the Republic and engages in offsite outreach with schools and the general public. With these activities and two new outdoor “rock gardens” in development, Matthew hopes that the public and younger generations will find inspiration to find out more about the beautiful specimens kept in the National Museum, and perhaps even pursue a career in natural history to keep the collections (and our knowledge about them) growing. To supplement this further, Matthew provides opportunities for students and universities to collaborate with the Museum, to encourage students and early-career researchers to contribute to the collections through fieldwork, and preserve collections from across the country that are at risk of being lost altogether. Thanks to the effort being made to preserve the collections and show the public what the natural world has to offer, the Natural History branch of the National Museum of Ireland continues to be an exciting and inspiring place to visit for all ages. The giant Irish deer skeletons at the entrance of the Museum are some of the most famous and distinctive animals on display here. One of the skeletons has an antler span of 3.5 metres. General admission to the National Museum of Ireland is free. The Museum is open all year round from 10am to 5pm Tuesday to Saturday and 2pm to 5pm on Sundays; closed on Mondays. You can take a virtual tour of the galleries at: http://www.museum.ie/Natural-History/Exhibitions/Current-Exhibitions/3D-Virtual-Visit-Natural-History.